Do you celebrate the Holidays with an Advent Calendar? Our Holiday Advent Calendar is one of my kids favorite traditions each year. 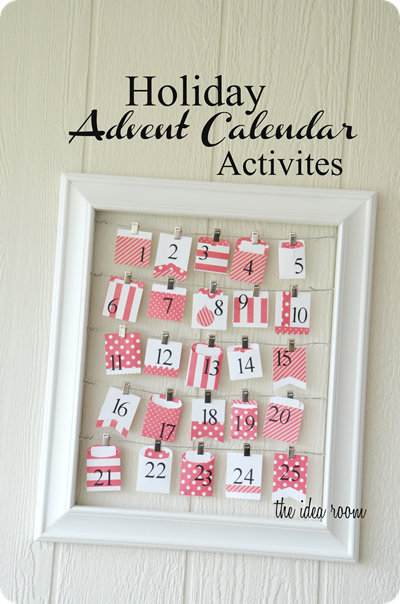 So I thought it would be fun to share some of the our Holiday Advent Calendar Activities. We choose not to have a candy advent calendar because the kids get so many sweets anyway during the holidays. So we put different Christmas activities for kids in ours. Now we all know how busy this time of year can be and sometimes adding one more thing to an already busy time can put us moms over the edge. So I type up a big list of activities and put it in my office drawer. Then right before the kids get home (or before we open that days advent) I cut off the activity that we can feasibly do that day depending on our schedule. Some days the activity is as simple as drinking some hot cocoa. But if we have a more open schedule we can do an activity that is more involved. THIS has been HUGE in helping us be successful with this tradition. Silhouette sent me their cute 2012 Advent Calendar. If you want to make one, you can get your own Silhouette Limited Advent Calendar here. 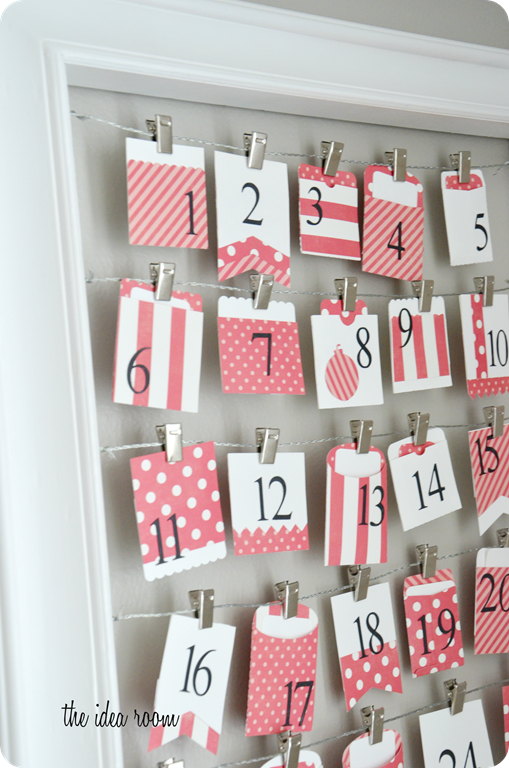 Here are some ideas of things you can include in your Holiday Advent Activity Calendar. 1. Decorate the Christmas tree. 2. Write letters to Santa. 4. Have a snowball fight. 5. Make Christmas cookies and surprise a neighbor or two with a plate. 6. Sing Christmas Carols together. 7. Write Christmas letters to relatives we will not see for Christmas. 9. Visit Santa at the Mall. 18. Do a secret service for someone in the family or a neighbor. 19. Make a gingerbread house. 20. Read an extra Christmas story. 21. Make some reindeer food for Christmas Eve (recipe here). 22. Read the Christmas story in Luke Chapter 2 and other scriptures. 24. Listen to Christmas music. 25. Set out cookies and reindeer food for Santa and his reindeers. 26. Read the notes in our love socks (more to come on this later). This Ebay Guide of Christmas Advent Countdowns. Do you do an activity advent? What are some activities that you include in yours? I love this idea and I hope to share this amazing idea on my blog!! Thank you for such a creative alternative to giving traditional Advent Calendar gifts! I love the activity advent! It became a tradition in our family when my oldest was two. She’s 34 now! I did the same thing with pinning up an activity on the day so it could be changed. Also did all of the meaningful Christmas things. We did a Jello-Slurp contest. Use a little more water in making Jello, so it is soft. Put equal amounts on everyone’s plates. Give each person a straw. On Go, try to be the first one to slurp up all your jello. We usually ended up in giggles before anyone won! We also did the balloon stomp game. Every person blows up the balloon, the less inflated the better. Tie the balloon to your ankle with a piece of yarn about 12″ long. At Go, everyone tries to stomp on another person’s balloon and pop it. Meanwhile you have to protect your balloon. Last person with an unpopped balloon wins. I always loved this one because it took so little time and could be used on a hurried evening. I’ve wrote a lot of stories about our Advent Calendar activities and Christmas traditions in my very sparse blog in 2010. I had the 24 Carols Before Christmas each with a story from our family. You can read more if you like there. 1. 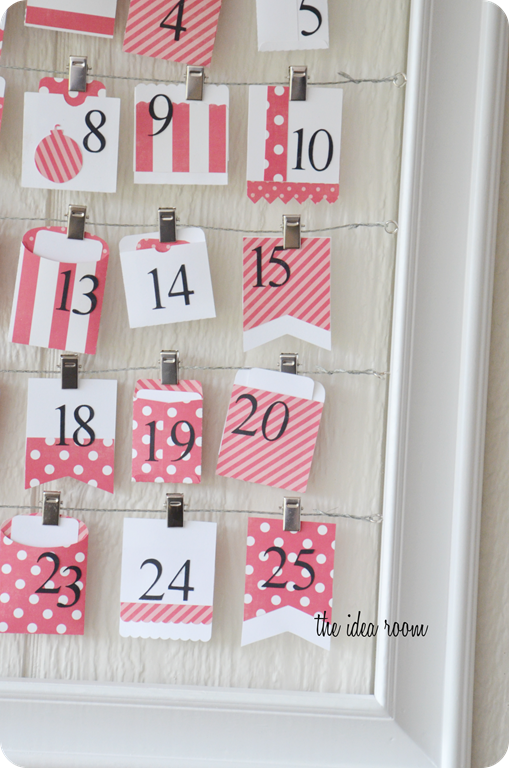 A calendar in a frame–the BEST display I’ve seen for a tight space! I’ll need to remember that one for next year. Every year we have an activity advent and it always seems like we don’t have time to do the activities. So, I think it’s a great idea to put it in that day. My kids do it in the morning to have something to look forward to all day. Last year I included “Today is (drink hot chocolate day, Bah Humbug day, etc. )” that I had gotten off of different websites. It made it a little more fun for my 12 year old son. this website consists oof remarkable and truly good material designed for visitors. I came across your blog and was enticed by this activity! How wonderful! Would you mind elaborating on the ‘Love Socks’?